▲ KUSU is proceeding the rally. Photographed by Kim Yeojeong. 4·10 Rally, a movement to seek students’ educational right, was held on April 10 at People’s Square. It began with a slight delay due to the rain. 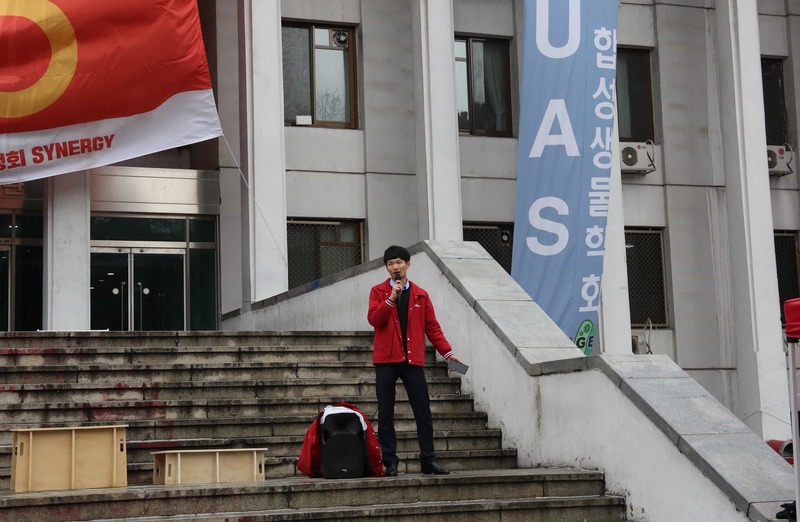 Korea University Student Union (KUSU) chose three main educational issues on campus as main agendas of this year’s rally: increase in the number of courses, removal of a classical Chinese test from graduation requirements, and improvement of laboratory facilities. KUSU had been recruiting members for the task forces (TF) of the three main agendas. Each representative from the TFs took turn to voice their opinion about the educational issues. President of the School of Media and Communication student union pointed out the decrease in the total number of courses, mentioning that there will be a meeting about the matter with KU’s faculty before the mid-term examination. Moreover, a representative from the student union of Department of Civil, Environmental and Architectural Engineering revealed the poor laboratory conditions. Lastly, question on the effectiveness of the classical Chinese test was raised. Meanwhile, speech was also given by personnel from outside the campus. Representative from Yonsei University (YU) Campaign Committee for Adjustment on Higher Education Act emphasized that YU and KU are in similar situation as a private university. Furthermore, KU Democratic Alumni Association (KU Mindong) KU Community for Democracy demonstrated its firm will to address the educational problem together. The event ended with students marching towards the Main Hall, following KU marching band Nongak band’s lead. Despite the harsh weather condition, 4·10 Rally was held successfully. KUSU is expected to continue campaigns to improve the educational environment on campus.